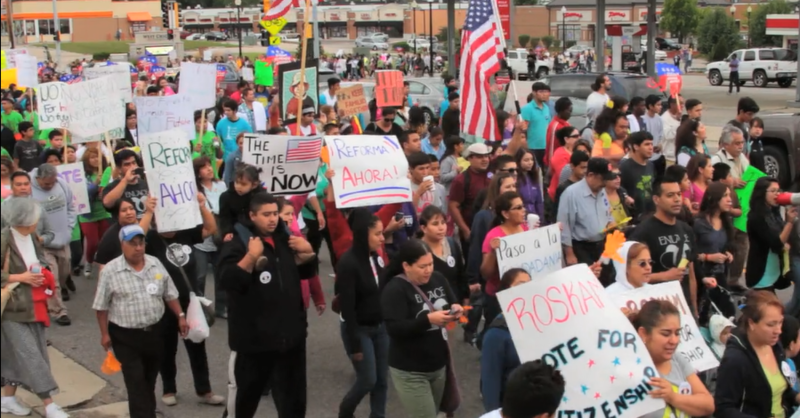 The fight for immigrant’s rights has been all too long and full of roadblocks, but despite the massive attacks that we are currently facing, it continues, gaining strength and wisdom from our stories. Filmmaker Mario Contreras documents the struggle through the lens of his family and explores the power of names, both in his family and as they relate to the movement. With the voices of activists including Ere Rendon, Rudy Lozano, Gabe Gonzalez, Miriam Martinez, Karla Martinez, Mario and Graciela Contreras, and Las Cafeteras (Hector Flores, Denise Carlos, Jose Cano, David Flores). “I started collecting footage for My Father’s Knee about 13 years ago but it just started coming together a few years ago. The story traces over my Father’s story as a Mexican immigrant to mine as a Chicano in the suburbs of Chicago. My journey of self-discovery is a distorted echo of how he integrated into life in the Midwest.